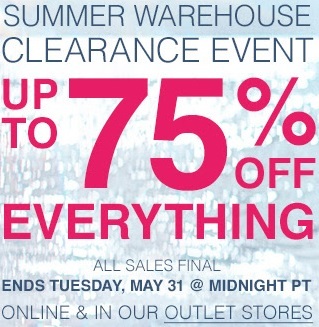 Enjoy shopping during Summer Warehouse Clearance Event at U.S. Tommy Bahama Outlets and online. It is possible to get all merchandise with discounts up to 75% from original retail prices. Source of the information is Tommy Bahama. Offer is valid until Tuesday, May 31, 2016. For more details visit your nearest U.S. Tommy Bahama Outlet.